Final call to provide your input! As stated in the Branson Community Plan 2030, "the City of Branson will expand and adapt indoor and outdoor recreational offerings to continue to serve the local and regional community as well as to meet projected demand." 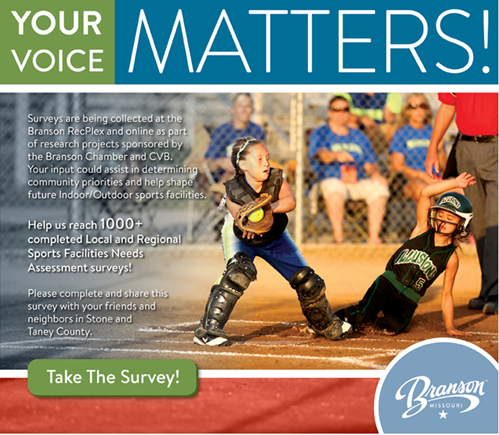 Surveys are being collected at the Branson RecPlex and online as part of research projects sponsored by the Branson Chamber and CVB. Your feedback could assist in determining community priorities and help shape future Indoor/Outdoor facilities. Thank you, in advance. Your time and input are greatly appreciated!